You are currently browsing articles tagged Rowing. An athlete and trainee teacher at the University of Reading says he is grateful for the support that allowed him to compete alongside Olympians at the recent international rowing championships. Francis Highton represented Team GB at the World Rowing Coastal Championships in Canada in October, after being given special permission to take time out of his studies by both the University of Reading and Wexham School in Slough, where he is carrying out his placement. This allowed the 27-year-old to compete alongside high-profile athletes like Zoe de Toledo, the British rowing cox who won a silver medal at the Rio Olympics in 2016, and Louisa Reeve, who represented Great Britain at Beijing 2018 and London 2012, as well as winning bronze at two World Championships. Francis is studying at the University’s Institute of Education and specialises in secondary Geography. He admitted juggling his studies and being a competitive athlete was a challenge, but was thrilled at being given the opportunity to do so. Francis, from Henley-on-Thames, continued: “It’s been a balancing act and it’s quite hard – harder than I expected. Lesson planning this year has been a lot more time consuming than studying, and I have that extra responsibility of focusing on my students. But I’m managing so far. Everyone is quite invested in how I’m doing and seem to really care. As soon as I got the opportunity to compete in Canada I spoke to the University and Wexham School. Being given permission to travel earlier allowed me to give my all in the race. I was even given the opportunity to speak to the school about the experience. Francis finished 7th out of 52 rowers in the Men’s Solo Single at the World Rowing Coastal Championships in Victoria, on Vancouver Island, between 11-14 October. He followed this up by helping his team to 4th place in the Head of the Charles Regatta in Boston, US – the world’s biggest two-day rowing event involving more than 11,000 athletes – the following weekend. 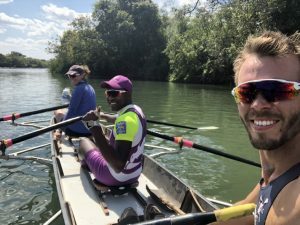 The opportunity to compete at both events emerged after Francis was part of the Row Zambezi team that rowed 900km along the Kafue river in Zambia this summer. The charity mission was to raise awareness of issues faced by the Zambezi River Basin and the Kafue river. The team carried out water quality tests and made wildlife observations while raising money to help the WWF and World Rowing build a water research and rowing centre there. Francis, who started rowing aged 15, said he was particularly pleased with his performance at the Coastal Championships due to his relative lack of experience of coastal rowing. “It was great to race on the world stage in Vancouver,” he said. “I hadn’t done a lot of coastal rowing and the boats are much bigger and heavier. It was a fantastic experience. To finish seventh in the world at something so new and exciting was great.